When you first arrive in Qatar, you’ll notice men wearing Thobes and women wearing Abbayas. These are the long dress or cloak like attire in white for men and black for women. Men sport brown leather sandals and the women usually have a 4 inch heel minimum designer shoe. The clothing is more cultural than religious and as someone who has done a fair share of travelling, the attire still seemed stand-outish and took some getting used to. It also means that approaching someone dressed so differently can, at first, be intimidating. Now one thing Qatari men are known for besides driving what seems like the national vehicle: white Toyota landcruisers with racing stripes and giant antennas, are for being hoons. Hoons? For the Aussies out there, you weren’t expecting a connection with Qatar were you? [The lowdown on hoons and hooning]. 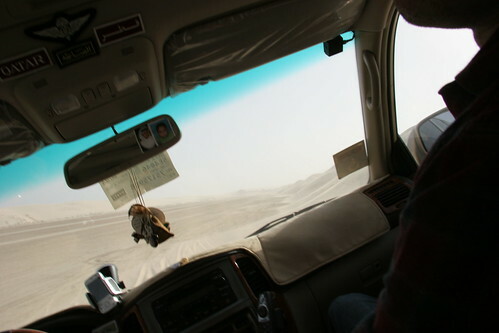 So now besides camels tying these two countries together, so does extreme Qatari hooning, at least this was one of the first things I learnt when driving. They’ll drive right up to your bumper bar (breaking is usually a bad idea in this case), flash their headlights repeatedly to get you to move out of their way so they can speed by. This behaviour is annoying, rude and unnecessary. After being intimidated by this at first I decided to counter attack by slowing down. If they wanted to exceed the speed limit, then they can drive around. But what took some time and digging was all the nice Qatari fellows who don’t drive like that and give their country and themselves a good name. The problem is there are so few Qataris (less than 2 million) in a teeny little country (Qatar can fit the size of the UK many times over – see here) that interactions of the sort, especially if you’re a non Arab female, are few. Days before I left Qatar I was on my way to a farewell party, when my little rental 2012 Nisan Tida decided to stop at a roundabout/intersection. It turned out that the fuel gauge was faulty and so by the time the gauge read 1/3 full, it really meant fumes. Thanks for telling me in advance Tida. Now this roundabout is one of the busiest in Doha and of course, what time of day should this happen? Right at the start of afternoon rush hour. I started calling around colleagues headed to the do to come to the rescue but before that happened and after almost 30 minutes of waiting, a BMW X5 had parked behind me with its hazard lights on. Out emerged a giant Qatari, in thobe and sandals who pushed, yes pushed the car out of the intersection a good 250metres. He also instructed me to drive his car yonder. Yes, random stranger handing off his X5. Then, he proceeded to drive to the nearest gas station, buy a jerry can, (with a wad of cash – common practice mind you), fill it with gas, return, fill up the tank then drive off into the sunset. Did he have ulterior motives? Well he was too polite to ask me for a number but did offer his sisters. Its worth noting that among the hundreds of people who must have driven by, he was the only one who bothered to stop and ask if I needed help. Thank you again random Qatari man, whoever you are. 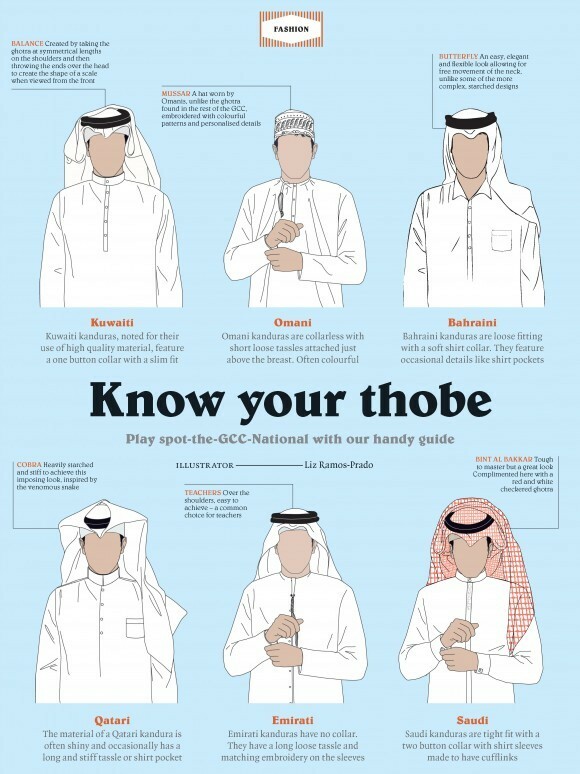 In lieu of a picture of Qatari man, note that not all thobes are created equally. I didn’t realise this until a Qatari/Yemeni friend pointed this out and realised there is such diversity in this part of the world that people are unfortunately too willing to simply judge and label. And yes before leaving, I too procured a tailor made Abbaya…but without the 4 inch heels. 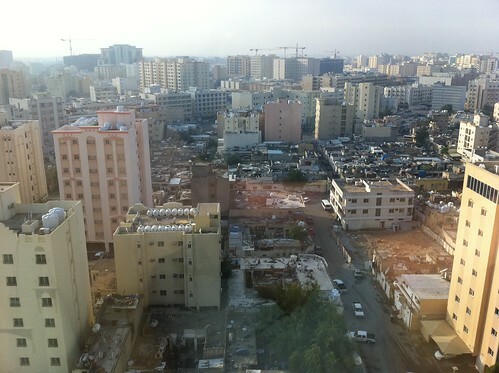 So, what do you think of Doha? Why walk when you can gondola? 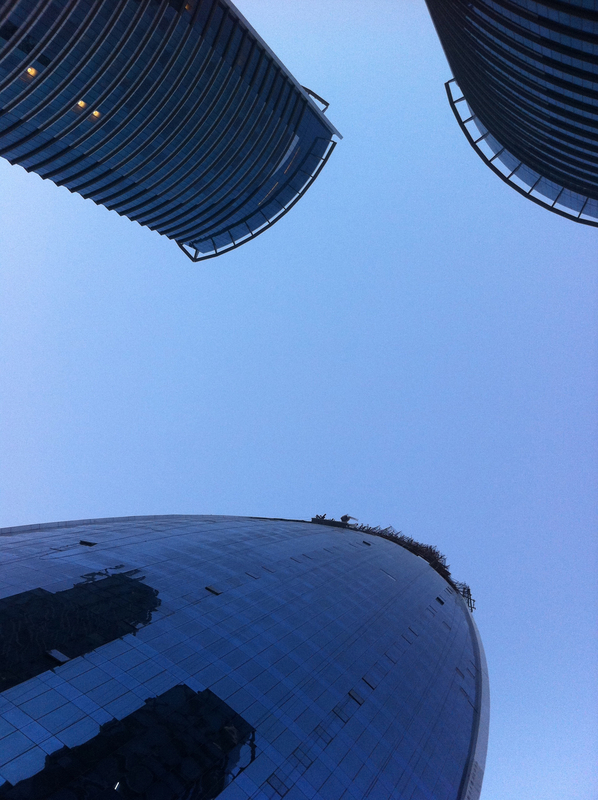 True, during my first weekend in Doha, I did what any ‘westerner’ does in a Gulf country: go to the mall. But this gets rather old….fast. 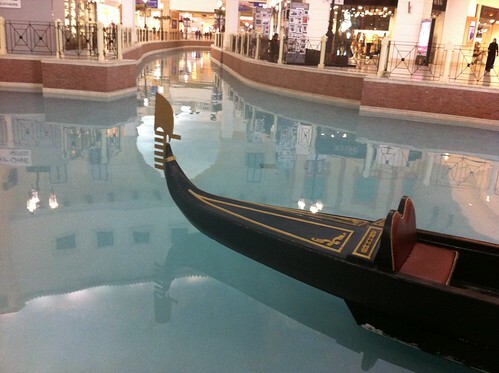 Yes, the mall might have its own gondola (yes really) and ice rink – not a surprise there so much and sensible considering the heat, but my answer to the ‘what do you think of’ question is’ has remained the same through all this time. It’s not sustainable. After all, how much shopping can satiate one’s consumer appetite? The desert can be interesting but how much camel riding, sand dune- ing, quad biking can you do until the adrenalin runs a little on empty? and then there are the dusty streets, neon lit stores, a far cry from plush residences and malls. There are efforts to reinvent, reinvigorate and integrate. The downtown Souk Waqef (outdoor and projects to build a hybrid residential-cultural-markety type area in the middle of Doha, that will take into consideration city design to create wind tunnels, maximize shade, for a place that is notorious for 50 degree Celsius plus weather). As a colleague once told me, no one moves to Doha for the weather. The weather is a restriction and impediment. I haven’t (yet) experienced a Gulf summer but it is basically ferry from one air conditioned building to the next. Efforts for outdoor bike-lanes will only go so far in the ‘winter’ months. Now, add to this mix a burgeoning consumer culture, an almost invisible recycling culture, a society heavily heavily dependent on cars and you begin to see what I mean. A trip to the edge of Qatar where a spanse of water divided Qatar from Saudi Arabia was marked by garbage. Indeed even the tour guides would toss drink cans down sand dunes and hills for the magic garbage fairy to pick it up. These seemingly small acts can add up to become larger problems. This isn’t sustainable and. Not for the environment and not for regional or global competitiveness. The solution will be to progress without sacrifice and without leaving the majority of the population behind. What will it take to change? Investments in education (building education city – a complex of satellite universities and other institutions) is one way to realize and maximize human capital. With so many ex-pats, the ground is ripe for global best practices to make an appearance. Another key is not to look outside for fulfilment. Instead of ‘looking for things to do’, how about looking within. Its during the quiet times that the opportunity presents itself to cultivate within. My list is ready: begin studying Arabic again, pick up guitar and piano, again, a limited symphony culture presents an opportunity to cultivate that, a lot of opportunity to read (thank you Kindle) and of course, not only get the skates on but start coaching again. At the end of the day, in my circles at least, people move to Doha because they believe in something that is bigger than themselves. 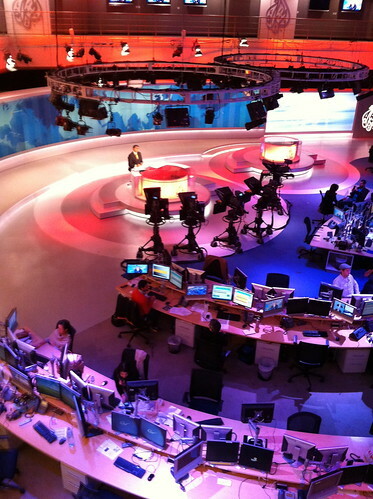 When you enter that news room, or walk past the galleries, you feel that collective intelligence and that collective consciousness. To be surrounded by people from 51 different countries, and a team who are on that journey with you, Doha living doesn’t look so bad.